Microsoft is announcing their Live Search CashBack program today which pays you to search using Live.com. It works like any other cash back program: if you buy a product by clicking a link in Live Search, you will get a percentage of the purchase price refunded to you. 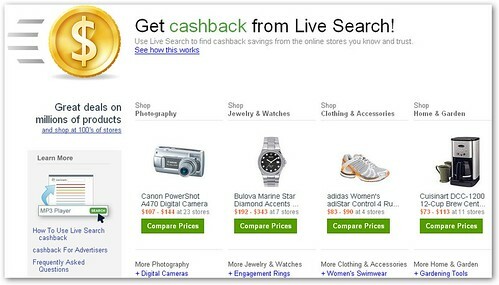 You can identify sites that participate in the CashBack program by a small gold coin icon next to each search result. Right now, there are hundreds of merchants that participate in the program, including Sears.com, CircuitCity.com, and Footlocker.com. For instance, if you often shop at Zappos, you can get a 9% cashback reward each time you make a purchase through the Live Search program. Once you reach a minimum balance of $5, you can transfer your cashback reward using direct deposit or by check. The only catch is that you must live in the US and be at least 18 years old. While the CashBack program might not help Microsoft beat Google in the search game, it might affect other cashback sites like FatWallet. FatWallet has a larger selection of merchants, but in many cases, the cashback rewards are lower than what you can get through Microsoft.